It’s never too difficult to take a 2017 Mercedes Benz E-Class Cabriolet for a drive. These are exceptional cars loved by owners of cars who like classy motoring. There is something almost mystical about the new E-Class Cabriolet. Definitely, the looks are captivating, and the chance for open-top motoring is always on the cards – more so in a sunny country like Australia. Good looks and lovely wind-in-the-hair motoring are what this car is all about. 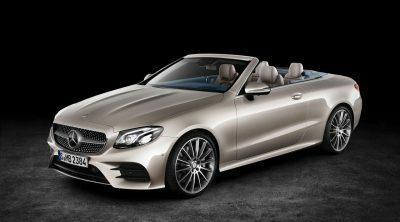 Now available in Australia, the 2017 Mercedes Benz E-Class Cabriolet has graceful lines that encapsulate what luxury and power is all about. A couple of models are offered, and they have the same elegant Mercedes lines. Drive one of these, and there is no other car quite like it on the road. 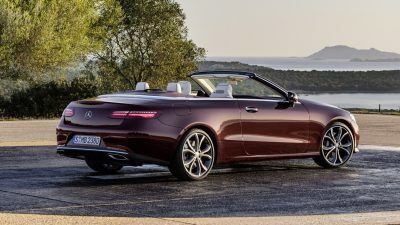 Owning a new Mercedes Benz cabriolet is a unique experience that makes your drive all that more distinctive. The E-Class Cabriolet has a fabric roof, which I think is classier than a foldable metal roof that folds like a Transformer’s arm going up-and-down. It takes just 20 seconds to raise or lower the fabric roof, which seals well when up. As long as you are travelling under 50 km/h, this task can be done at the push of a button. 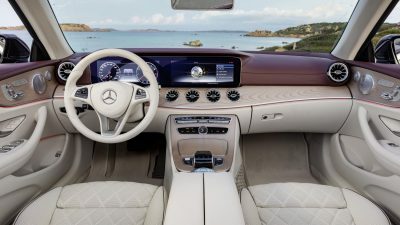 Not only is the exterior very classy, but the Cabriolet’s cabin is impressive, and the more options you equip your new E-Class Cabriolet with, the fancier it will look. Standard items which include leather trim, multifunction media and satellite navigation keeps you at the cutting edge of motoring technology. There is a real feeling of techno-elegance, with minimal switchgear and a dashboard fascia that is dominated by the widescreen 12.3-inch touchscreen. Functions such as navigation, audio and ventilation are displayed on the screen clearly and attractively. I love the chrome turbine style air vents on the dash – adding more razzmatazz – and reminding you that you are driving a car with the tree-point star on the front. The car seats four adults in premium comfort, but only four – which is fine. I think a middle passenger on a rear bench seat would find it snug. 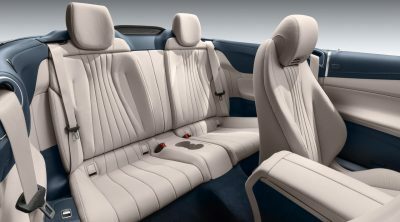 That said, the rear seats provide reasonable room and the occupants have cup holders and auxiliary inputs. You can kit the car out with rear seat heating and even TV. All models come equipped with a very nice Burmester surround sound system that puts out some awesome sounds – and if you really want to draw more attention to yourself, try playing loud music with the top down. Any cabriolet can suffer from wind turbulence, but with Mercedes Benz, the art of controlling this is mastered. Mercedes is among the best in the business at keeping swirling air in the cabin to a minimum. The clever AIRCAP draught excluders work the air away from inside the cabin particularly well. With the roof down and at motorway speeds it isn’t too difficult to hold a conversation with other occupants. When it comes to putting the fabric roof back in place, the Mercedes Benz E-Class Cabriolet becomes snug and quiet. Quite the charmer, the 2017 Mercedes Benz E-Class Cabriolet has a laid-back ride that is very enjoyable and comfortable. Push on, and the car holds the road really nicely. Two engines are available in the new E-Class convertible, and they are powered by gasoline. The smaller engine will be popular; it’s a 2.0-litre turbo unit that provides a crisp 180 kW. Power and efficiency is what this inline-4 cylinder motor is all about. Wanting for more power will mean you’ll be looking at the larger V6 3.0-litre with 245 kW. Implications of the larger output means you can send yourself gunning for 100 km/h from a standstill in around 5.5 seconds thanks to its twin turbo technology – that’s freaking fast! The smaller 2.0-litre can still scamper through the same time trial in less than 7 seconds. That said, the E-Class Cabriolet can be driven very quickly but it is just as happy to waft along in a relaxed refined manner – which also kind of suits the Merc style. It would be nice to see a diesel option available; maybe that will be coming in the near future. We’ll just have to wait and see. For any more information on the latest Mercedes Benz E-Class Cabriolet models or, for that matter, any other new car, contact one of our friendly consultants on 1300 303 181. If you’d like some fleet discount pricing (yes even for private buyers! ), we can submit vehicle quote requests out to our national network of Mercedes Benz dealers and come back with pricing within 24 hours. Private Fleet – car buying made easy!